This map is symmetric, with two identical forts facing each other. Originally designed as a 5v5 or larger CTF map, it plays ok in DM modes with enough players (10+). Each fort is comprised of multiple floors. The basement level consists of a short hallway and staircase leading up from the sewer as well as an underwater tunnel leading to a grate-covered pit visible from above on the first floor. The first floor spans the entire fort, is accessible via staircases from the basement and second floor as well as front and back doors leading outside, contains two playerstart positions, and provides excellent visibility of the 3 other floors as well as the outdoors through large windows. The second floor is reached via two staircases and holds most of the ammo inside the fort, as well as a green armor. It provides access to the upstairs windows and the rear balcony as well as a jumppad to the third floor, and has good visibility of most of the first and third floors and the outdoors. The third floor is reachable only via jumppad or rocket jump and contains a healthboost. The third floor also provides the ideal location for flag placement in CTF mods. Outside the forts there is a very large outdoor area comprised of a simple maze. 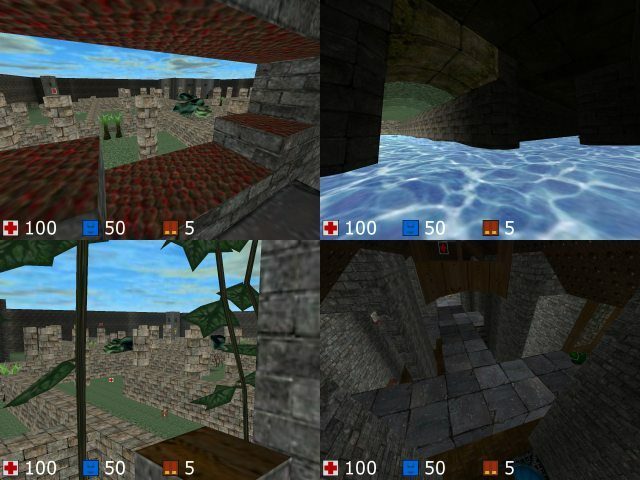 Series of platforms lead from the corners of the map up to the middle to acquire the quad, with health boosts placed along the way. Also located outside are two sniper towers accessible via jumppad at their bases. One playerstart position is placed at the base of each tower. Visibility ranges from poor to excellent, including into the first floors of the forts. Ammo and health is generously distributed. Below the map lie sewers, both lit and unlit. The sewers are accessible via staircases within the forts, outside the forts, and at the base of each tower. They are also visible through grates in the ground outside and above the pits inside the forts. Two playerstart positions are placed in the sewers, as well as health and ammo, with two yellow armors in the pits under the forts. WQD gets up to 10000 due to very few occluding walls, with an average of around 3500. A large number of mapmodels on this map, mostly neccessary for architecture, leads to lower than expected FPS. LOD adjustments can help, but not to the same extent as on a cube-only map. Please note that this map cannot be used as-is in Quad CTF because of Quad's replacement jumppad mapmodel and incorrect handling of stacked Bridge mapmodels.